Henry Laurens was in a bit of a quandary at the onset of the American Revolution. The namesake o f the only American Revolutionary War fort built in what now is the state of Ohio, could have just as easily been an English Tory as he was an American patriot. 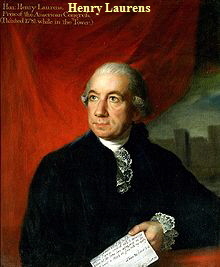 Born in Charleston, South Carolina in 1724, Henry Laurens was sent to England by his father, a well-to-do saddler, around 1744 to learn a trade. Henry trained under a prominent British merchant and soon became very adept at the business. He returned to his native Charleston in 1747 arriving just a few days after his father's death. At the young age of 27, Henry utilized many of his merchant learnings while dealing with his late father's estate. He was quickly bartering a large stock of saddlery ware with merchants in New York in exchange for "refined sugar, starch in small casks, good flower, and a few casks of Milk Bisquitt." He soon established himself as a very successful merchant importing rum and other products from the West Indies and manufactured products from Mother England. He exported such items as rice, tar, pitch, deerskins, Carolina indigo, lumber, silver and gold. 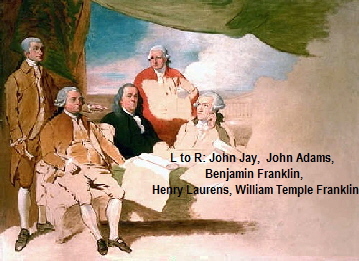 As was the case with many prominent Southern merchants at that time, Henry Laurens was also involved in the slave trade. Although he owned hundreds of slaves and profited from the business, he became one of the first men of stature from the South to express his disgust with the institution of slavery. Laurens reinvested his profits into purchasing land in South Carolina and Georgia. "By the early 1770s he was one of the most wealthy men not only in South Carolina but of all the British colonies in America. "4 During this same time period, he returned to England to oversee the education of his three sons. Laurens took a leadership role in South Carolina public affairs as royal authority disintegrated. He served in the South Carolina First Provincial Congress, served as President of the South Carolina Council of Safety, helped write the state's first constitution in 1776, and became Vice President of the state. He began to emerge as a national leader with his election as a member of South Carolina's delegation to the Continental Congress in 1777. He was with the Congress when they fled Philadelphia from the advancing British army, which took possession of the city in September 1777. The Congress established temporary headquarters in York, PA.
On November 1, 1777, his colleagues elected Henry Laurens President of the Continental Congress. Under his stewardship, Laurens helped establish the French Alliance and the Articles of Confederation, in effect the first constitution of the United States. Laurens was a staunch supporter and close personal friend of General Washington. While Washington led the American army, Laurens led the new nation's central government. It was under Laurens that the Continental Congress authorized the construction of Fort Laurens in the Ohio Territory as proposed by General Washington. Seventeen days after General McIntosh began construction of the wilderness outpost on the banks of the Tuscarawas River, Henry Laurens resigned the Presidency of the Continental Congress on December 9, 1778. General McIntosh's tribute to his friend Henry Laurens was obviously naming the wooden stockade, Fort Laurens. Laurens continued to serve the American cause. In 1780 he was sent by Congress to negotiate a treaty of friendship and commerce with the Netherlands. During the journey over, the British seized him on the high seas. He was charged with treason and imprisoned in the Tower of London. He was eventually released in 1782 and exchanged for Lord Cornwallis, Lt. General of His Majesty's Forces in North America. Upon his release from the Tower of London, he was again pressed into service when he was appointed by Congress as one of the commissioners to negotiate a peace treaty between the United States and Great Britain. Laurens finally returned to America in 1784 and reached Charleston early the following year. One of the last official acts of the Conservative Revolutionary was as one of South Carolina's presidential electors when he cast his vote for his old friend George Washington as president. Henry Laurens died in 1792 at the age of 62. Hamer, Philip M., Rogers, Jr., George C., Lyles, Maude E., eds. The Papers of Henry Laurens. Columbia, SC: University of South Carolina Press, 1968, I, 106. Note: The painting above by Benjamin West titled "American Commissioners of the Preliminary Peace Agreement with Great Britain" also sometimes referred to as "Treaty of Paris" was never finished because the British commissioners refused to pose.